A praying mantis named after Ruth Bader Ginsburg. Supreme Court Justice Ruth Bader Ginsburg and Ilomantis ginsburgae. When scientists at the Cleveland Museum of Natural History discovered a new species of praying mantis while studying the insects’ genitalia, they knew exactly what to do: name it after Supreme Court Justice Ruth Bader Ginsburg. 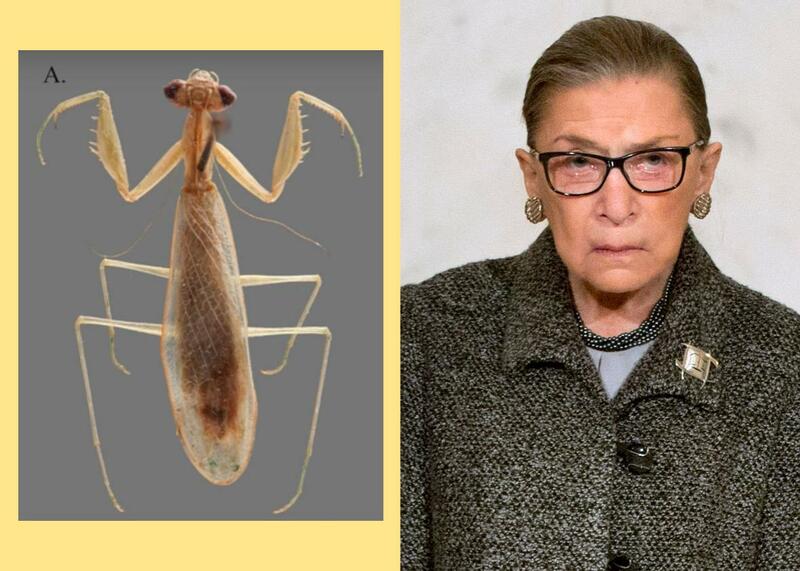 Brannoch named the mantis after Ginsburg on account of the justice’s “relentless fight for gender equality”—an apt tribute, given the feminist-tinged method by which ginsburgae was discovered. The researcher also chose Ginsburg because of her love of jabots, the frilly lace collar the justice often wears on her robes. Brannoch sees a jabot-type quality in the mantis’ neck plate. “A prime part of the history of our Constitution,” Ginsburg once wrote, “is the story of the extension of constitutional rights and protections to people once ignored or excluded.” It is wonderfully fitting that this long-ignored species—identified through female specimens, discovered by a female scientist—now boasts the name of the female justice who helped extend rights to so many.